A second bite of the apple is considered an unexpected opportunity or unplanned reward. In our PR work, we make the effort to get those second bites in our media interactions all the time, stretching stories or revealing additional news opportunities. Our media approach in the NY National Guard is to frequently offer three bites of an apple to news editors. We’ll announce information about events prior, issue a media advisory for a key event and then very often release our own story and imagery after the fact, just for news outlets that still might want the story. Overkill, you might say? Well, in a very demanding media market where pitches can easily slip by, giving multiple opportunities serves up reminders to news editors and can generate buzz. Besides, in my line of work, overkill is a good thing! 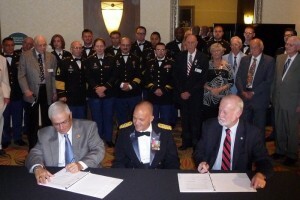 Just last week, the New York National Guard’s 42nd Infantry Division Headquarters, based in Troy, hosted the 92nd annual reunion of the Rainbow Division Veterans Memorial Foundation. We offered up those three bites to the news media, literally three chances to come out and gather a news story about the event. Now for a three-day reunion of veterans telling their stories and socializing at evening affairs, I had conservative expectations. But surprising even me, media coverage came out on each of the three days to tell the story, and in a variety of ways that made each story unique. Thankfully, we had three unique offerings for news stories – an opening ceremony in Saratoga Springs on Thursday, a reunion of Iraq war veterans on Friday and a formal signing of an education benefit for veterans on Saturday. Our initial media announcement covered the basics and let new editors know that more opportunities would be coming, especially when our events were held in the evening hours and over a weekend. Paul Post, from the Saratogian, always looking for unique character stories, prepared a terrific interview with a Capital Region WWII veteran, making the front page of Friday’s paper, and saw his story published in the Kingston Daily Freeman. Joining us that initial evening as well was Taryn Kane from News 10, who really captured the message of the reunion, passing the torch from the WWII generation to today’s veterans of the 42nd Infantry Division. 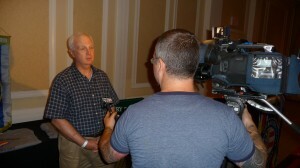 I was glad that the initial reporting could generate a buzz for additional media interest for the weekend. 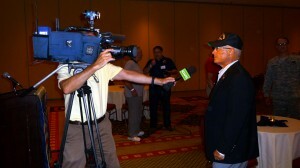 On Friday we held a special reunion reception for the Iraq war veterans and were joined by Fox 23 and WRGB Channel 6 news cameras for voiceovers on their late night news later that evening. And on Saturday evening, we had the unique story angle of welcoming Excelsior College to the reunion, signing a formal agreement providing tuition benefits to the foundation’s members. Dan Levy from News 13 came out and covered that agreement signing with Excelsior College. Six news items covered in seven outlets in three days. No bad apples in that bunch! So as you plan your upcoming events, consider how you might offer up multiple bites of your news apple to editors. Whether you spread out your PR opportunities over time, location or simply offering different news angles, give editors multiple bites and you just might wind up with multiple stories. For more information about the New York National Guard Public Affairs efforts, visit our website at www.dmna.ny.gov.